Do you have a sweet tooth? Instead of picking something unhealthy to satisfy it, go for dark chocolate. 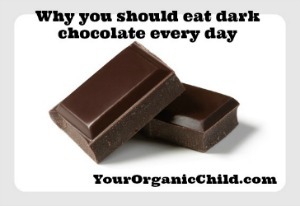 Dark chocolate is loaded with nutrients that can positively affect your health. Dark chocolate, unlike other chocolates, is extracted from cocoa trees. Cocoa beans are among the best sources of antioxidants on the planet and can improve health and lower the risks of heart disease. Here are some health benefits of dark chocolate that you may not know. It might sound too good to be true but dark chocolate is great for your heart. Dark chocolate restores flexibility to the arteries and at the same time prevents white blood cells from attaching themselves to the walls of blood vessels. In addition, eating dark chocolate at least two to three times a week can help lower your blood pressure. Dark chocolate further regulates blood flow and reduces the risk of blood clots. Adding dark chocolate to your diet can also help reduce the risk arteriosclerosis, i.e. hardening of the arteries. Arteriosclerosis gradually restricts the blood flow to the organs and tissues. As people get older, they are prone to arteriosclerosis. A healthy circulatory system is imperative to living a healthy lifestyle. It is more or less the unsung hero of the human body that keeps you fit. The circulatory system is a complex network of blood arteries, blood vessels and capillaries. As you age, your blood vessels wear out and become less flexible. This hinders their ability to transport oxygen so maintaining a healthy circulatory system is a vital part of healthy living. Flavonoids are a group of antioxidants that help maintain healthy blood vessels. Luckily for you, dark chocolate is rich in Flavonoids. Flavonoids stimulate the endothelium, which is the lining of the arteries, to release nitric oxide (NO) gas. One of the major functions of flavonoids is sending signals to the arteries to relax. This lowers the resistance of blood flow, thereby reducing blood pressure. Iron: Severe iron deficiency may cause life threatening diseases, such as anemia and chronic anemia. Potassium: Potassium provides relief from hypertension, strokes and heart and kidney disorders. Magnesium: Some major benefits of magnesium include initiating the transmission of nerve impulses and regulating body temperature. Copper: Copper offers a variety of benefits, which includes reducing the symptoms of arthritis. Are you tired of experimenting with a variety of beauty products to achieve glowing skin? Perhaps, you need to make a few changes to your diet instead. The bioactive compounds present in dark chocolate are great for your skin. Flavonoids protect the skin against sun induced damage. This helps improve blood flow and increases skin density and hydration. So, if you are planning on heading out for a beach vacation, it’s imperative you stock up on dark chocolate prior to that. Adding cocoa to your diet can significantly improve your cognitive function, verbal fluency and reduce the risk for several diseases. Price Tag: The price tag will determine the quality of the dark chocolate. This means high quality chocolate bars will be pricier as compared to commercial grade chocolates. Ingredients: High-grade dark chocolate bars mostly consist of cocoa solids and cocoa butter. While reading the packaging, if you notice a string of foreign ingredients that you cannot recognize or even pronounce, for a different brand. Beware of additives that may wreak havoc on your health instead of providing health benefits. Always go for the organic dark chocolate over conventional. Check the Date: The date of manufacturing plays an imperative role in determining the quality of dark chocolate you are about to buy. The more recently the chocolate is made, the fresher it is likely to be. Dark chocolate is mostly recommended to be eaten within one year. Look at the Chocolate: If it is possible, assess the surface and texture of the chocolate you are about to purchase. Good chocolate has a shiny and glossy appearance. In case of dark chocolate, the darker it is the better. I always opt for dark chocolate that has at least 73% cacao. The more percentage of cacao the better. Perform a Taste Test: The best way to determine the quality of the chocolate is the taste test. True dark chocolate should melt in your mouth and taste slightly bitter. If you are unhappy with the chocolate you have purchased, you can opt for a different brand the next time around. So, follow these tips when buying dark chocolate and you will be able to enjoy the health benefits it offers. My personal favorite dark chocolate is below.